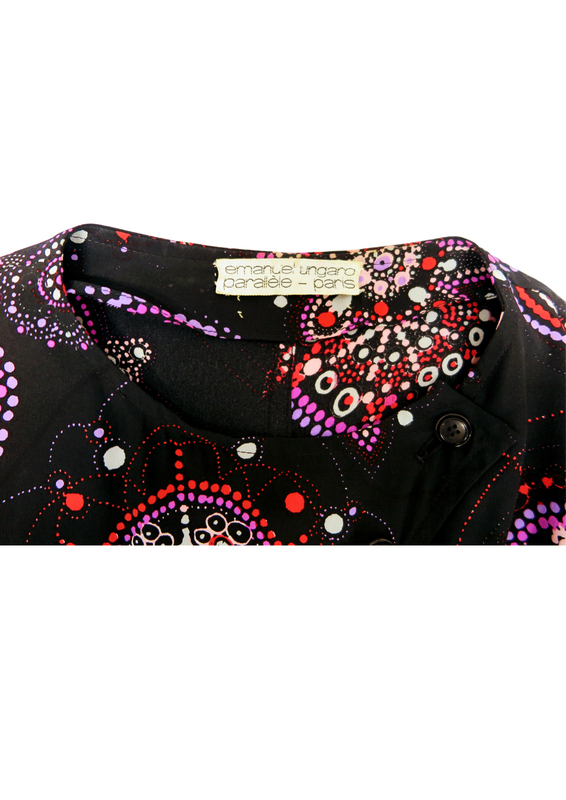 Vintage Emanuel Ungaro ‘Parallele – Paris’ blouse with a striking abstract, slightly psychedelic, floral pattern in vibrant colourways of red, fuchsia, purple, lilac, pink & grey that pop out from their jet black background. 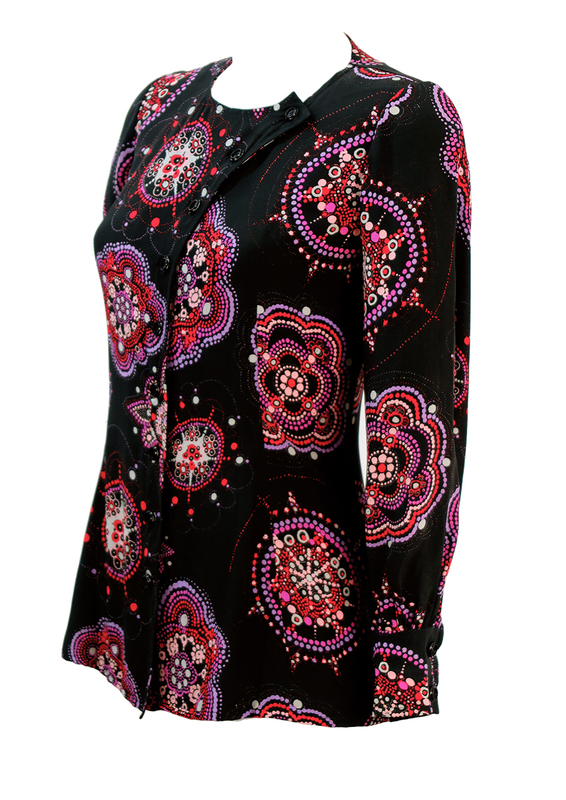 The blouse has lovely design features that include asymmetric buttoning that curves at the neckline, gentle ruching at the cuffs and a weighted down hem. 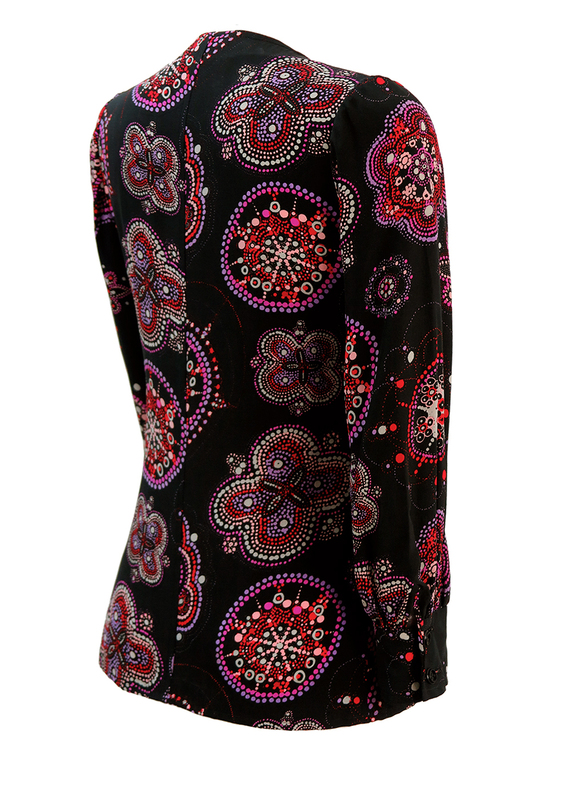 There is no fabric label, however the blouse has a matt, mid weight silk-like feel to it and is in excellent condition. We have sized the garment as a size S – please refer to our measurements for further sizing guidance. *Only applies to item(s) that weigh under 2kg. **For Standard UK Delivery, please note that the following areas should expect delivery between 3-5 days due to Royal Mail restrictions: Postcodes – BT (Northern Ireland), GY (Guernsey), HS (Outer Hebrides), IM (Isle of Man), JE (Jersey), KW (North Scotland, Wick), ZE2&3 (Shetland Isles) and BFPO (British Forces Post Office). Next Day and Saturday Guaranteed Delivery services are not available to all UK postcodes and will be shown at checkout if offered to your address. Click here for more information on UK Delivery including Terms and Conditions. We are happy to deliver to multiple worldwide destinations. To calculate how much delivery to a different country costs, please click here for more information on International Delivery. You can return any item (excluding hosiery, underwear and swimwear) you are not completely happy with for a refund, within 14 calendar days of initial delivery. Click here for more information on our Returns Policy. Excellent Perfect condition. The garment has no flaws, marks or repairs. Very Good The garment has some very subtle wear or flaw in an unobvious place that can’t be seen. This will be highlighted in the product description. Good The garment has slight wear or a flaw in a more obvious place. This will be shown in the photo gallery and highlighted in the product description. 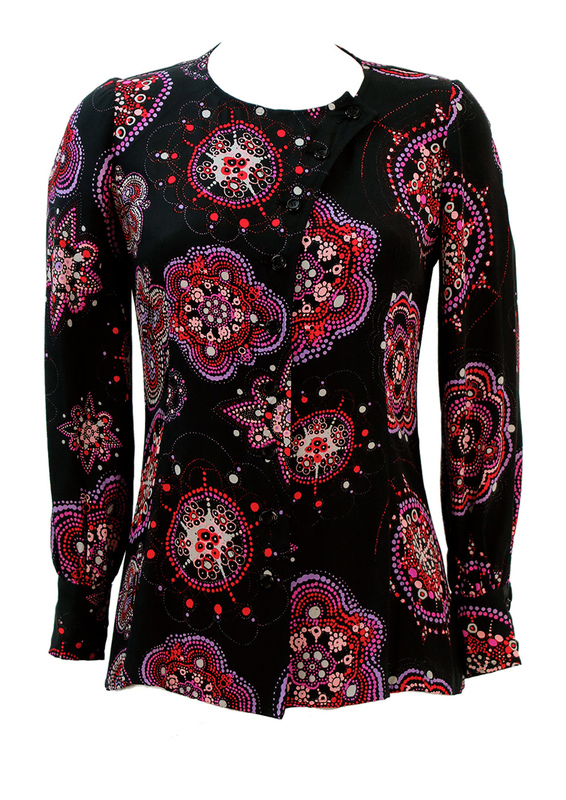 Fair The garment has visible wear or flaws due to its vintage age. 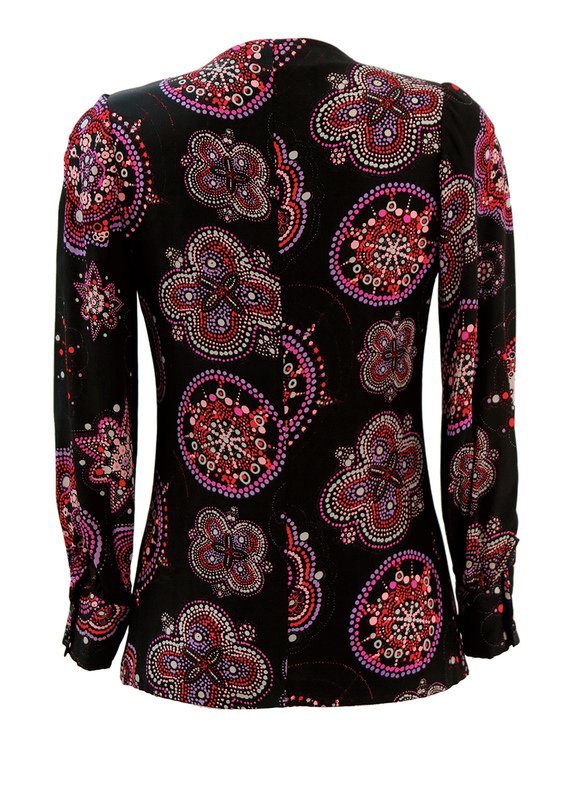 However, the garment is considered to be a highly desirable or collectable/antique piece. This will be shown in the photo gallery and highlighted in the product description. Unused Deadstock. Garment has never been worn and original retail tags may still be attached. Chest Measurement from underarm to underarm then doubled for correct sizing. You can measure this by wrapping the tape around the fullest part of your chest. Sleeve Measurement from the shoulder to the cuff. Raglan Sleeve Measurement from the top of the neckline to the end of the sleeve cuff. Some garments do not have a shoulder seam due to a ‘Raglan’ sleeve design, where the shoulder has a seamless curve. As there is no specific shoulder seam from which to measure the sleeve length, we measure from the top of the neckline to the end of the sleeve cuff to provide better accuracy. Length Measurement from the shoulder to the lowest point of the hemline on the garment.